Up to 60 bands in colourful costumes have been taking part in the Grand Finale street parade. There were also 38 sound systems to entertain crowds. More than a million people are believed to have attended the event across the two days. Hundreds of thousands of people attended Europe’s biggest street festival, the Notting Hill Carnival. 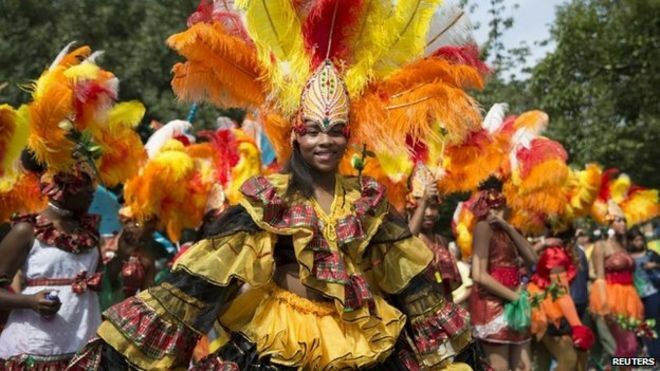 The two-day event in west London started with children’s day and featured Caribbean culture, food, music and dance. Giant floats and dancers wearing colourful costumes made their way along the procession route from 10:00 BST. About a million people are expected at the two-day event which ends on Monday. Organisers say this year is part of the build-up to the event’s 50th anniversary. About 6,000 police officers attended and the Met Police said they had arrested 95 people for offences including drugs, public disorder, assault, possession of offensive weapons and theft. Ch Supt Robyn Williams said the force’s priority was to “facilitate a safe and vibrant carnival”. Europe’s biggest street festival, the Notting Hill Carnival, has opened with thousands of revellers watching a parade of giant floats through London’s streets. Up to one million people are expected over two days for a feast of Caribbean culture, food, music and dance, now in its 49th year. Hundreds of youngsters took part in the children’s day of the carnival, which traditionally starts the event. Prior to the main carnival, the J’ouvert event from 06:00 BST opened proceedings with a procession and a paint fight. During the parade, the Chocolate Nation Mas float was followed by hundreds of people throwing liquid chocolate over themselves and the public as they danced through the streets. Michelle Johns, 37, from Lincoln, who watching the procession with her family, said: “The group was spraying the chocolate around and going right up to them and spreading it on the officers’ faces. This year’s event will pay tribute to the steel pan, the national instrument of Trinidad and Tobago, which has been a significant feature of the carnival from 1964 until the present day. The Notting Hill Carnival Enterprises Trust said some people thought the first carnival took place in 1964, but others argue a street parade took place the following year. A crackdown by police in the run-up to the carnival on 21 August saw officers make 126 arrests and seize guns, drugs and about £78,000. Officers known as “super-recognisers” are trained to spot anyone banned from attending the carnival in the crowds.